Householders prosecuted for hiring Facebook fly-tippers. A new breed of unlicensed waste disposal criminals have been dubbed the “Facebook fly-tippers”. Typically, these are one- or two-man operations, often called “a man with a van” and now they’ve taken to Facebook to advertise their unlawful services. And unwary members of the public can end up with fines and a criminal record if they use one of these Facebook fly-tippers, even if they do so unwittingly. It is in fact the responsibility of a householder who is disposing of waste to ensure that any carrier they use has all the requisite licences to dispose of waste. Whether its garden waste, old furniture or building rubble, the individual getting rid of the rubbish is responsible for its final disposal. One 23-yer-old woman in Somerset got herself on the wrong side of the law by hiring a Facebook fly-tipper and had to pay costs and a fine of £290. Her waste was discovered in a country road. 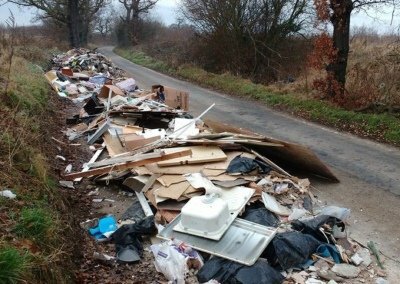 In another case in Somerset, a man paid £30 to dispose of rubbish and ended up with a bill for £235 in costs and fines. A man in Tooting, South London hired someone to take away his rubbish. When he found out that the man had fly-tipped the waste, he went and tidied it up himself. Despite this, he still had to stump up £670 in fines and costs. Yet another man from Wolverhampton used someone he found on Facebook to take away his rubbish. The waste then turned up dumped in a country park. He was fined £440 and landed with a costs bill of £1,064. Man & van fly-tippers get six months in jail.